The ST4 is a design made to continue our own inimitable niche: bikes for mountain biking, pure and unabridged. Like the original Mk1, the new Mk2 frame is a responsive low-slung trail missile, efficient on the pedals but with downhill poise that belies its travel. It’s not about fashion; it’s about the ride. Built for all-day missions, the ST4 uses a low leverage ratio to produce 110mm of buttery smooth travel. Rather than use a shorter 165 mm shock the ST4 takes a lesson from the Blood, running a 190mm custom tuned Fox RP23 for perfect progression. The geometry that made the original a classic, but updated to markedly stiffen the chassis laterally and incorporate linkage development from the Strange department. If you want to redefine the rules of XC, the ST4 starts afresh. It might not fit the existing industry tags, but it’s built for the way most of us ride. 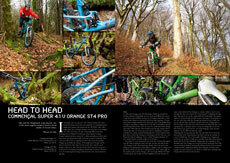 Up, down and along, the ST4 is the remedy to your bike pondering woes. Just get on and ride, the ST4 does the rest. The Five Pro Blackout is only available in a Limited Edition of 10 bikes. The Blackout model features exclusive Hope Tech X2 Special Edition brakes, with black floating rotors, black mounts, and titanium bolts throughout. A Hope headset, rear QR skewer and seat-clamp continue the British theme. Pushing the ST4 Blackout as even more of a trail warrior, this build is up-specced from the Five Pro version the travel adjustable Fox 32 TALAS FIT RLC. Flicking between 110 and 140mm of travel, optimised spring curves keep forks working perfectly in climb or descend position, with the lockout and force adjuster dial making the return home that little bit easier. Is this the ultimate all-rounder? We think so. Why the ST4 Pro Blackout? The ST4 is that unusual bike which doesn’t masquerade as anything other than a sweet handling XC trail bike. No modern tag terms, just a fantastic bike built for all-day rides and the rolling trails we love to ride at home. Plus this one's a rare Limited Edition model. If you want more travel, look at the Five, less travel, consider a hardtail. Bottom bracket height measured from ground with 670mm ø tyre.